Diverting Valves - R-Cap Process Equipment, Inc.
Divert valves are designed to meet specific applications for diverting dry bulk material in a pneumatic conveying system. Manufactured from quality castings and precision machining. Offered in carbon steel, stainless steel or aluminum. 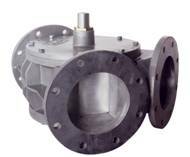 Gravity Flow Diverter Valve diverts material into either of two lines intersecting at an angle of 60 degrees. Valve is fabricated with a bucket design so that when material is being fed through one leg of the valve there will be minimal dusting in the opposite leg. Plug Diverter Valve diverts material into either of two lines intersecting at an angle of 45 degrees. The valve is machined to close tolerances so that when material is being conveyed through one leg of the valve, leakage is held to a minimum eliminating contamination in the dormant leg. Slide Diverter Valve provides a simple and versatile means of diverting product in pneumatic conveying systems. Air inflatable seals provide a dust tight connection at either position.